Contemporary jewellery is often concerned with the personal stories and journey of the maker. Born in the Netherlands, into a family of collectors, I spent my childhood in South Africa, returning to the Netherlands to complete my secondary education, before moving to Australia. Ours was a world of dazzling natural environments and exotic cultures. Family trips into the "veld" and later, "bush" would yield unexpected booties and a wealth of impressions while second hand shops and roadside vendors were a source of many extraordinary finds and experiences that frequently find their way into my jewellery. The idea of preciousness in jewellery and the pursuit of beauty in the discarded and overlooked are enduring themes in my work. 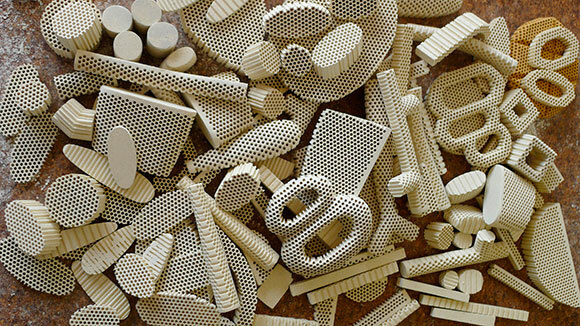 Since 2008, I have been experimenting with a refractory material, ceramic honeycomb. Usually a soldering aid on thousands of jeweller’s benches around the globe, this unlikely stuff has become the key focus in my practice. The selection and organization of materials to give form to thoughts and experiences is often the most exhilarating and challenging aspect of the making process. My desire is to create poetic jewellery objects, where each part is transformed by its juxtaposition with another and has a crucial role to play in the final composition.